Exercising in the heat...stay safe! I suppose it's okay that it's finally hot outside since it IS August, but I sure enjoyed the mild summer weather we were having! As I started my run this morning, I was drenched with sweat two minutes in. And then later today, my active three-year-old came to me thirsty and red-faced with his hair wet with sweat. Keep your family and yourself safe while being active in the heat! • CHUG-A-LUG! Down about two cups (16 oz) of water and hour or two before exercise. Drink ½ cup (4 oz or about 2-3 gulps) every 15-20 minutes during exercise. And be sure to continue drinking water even after your workout is complete to ensure that you are properly hydrated. • TAKE IT OFF: Wear light colored, breathable clothing. If you’re starting your workout in the morning and it is cool out, make sure to wear layers that you can remove as your body heats up. • SLATHER IT ON: Working out in the sun is a great way to work on your tan, but also an easy way to get too many rays. Don’t forget the water proof sunscreen, hat and sunglasses to protect your skin and eyes from the sun’s damaging rays. • SLOW IT DOWN: Your body may need up to 14 days to acclimate itself to warmer weather, so when you start out, slow down for the first few workouts to see how your body responds to overloading when in the heat. Slowly increase your duration and intensity as your body becomes used to the heat. The biggest thing when working out in the heat is to stay hydrated. As long as the body is hydrated it can regulate its temperature, but if you aren’t ingesting enough water, your body starts to store heat inside, raising your core temperature which puts your organs and central nervous system at risk…yikes! So what happens if you get overheated? You can be at risk for heat exhaustion or heat stroke. Check out the symptoms of each in case you or someone your know needs help. When it's not outside, there is not much that satisfies more than a cold, juicy piece of watermelon. 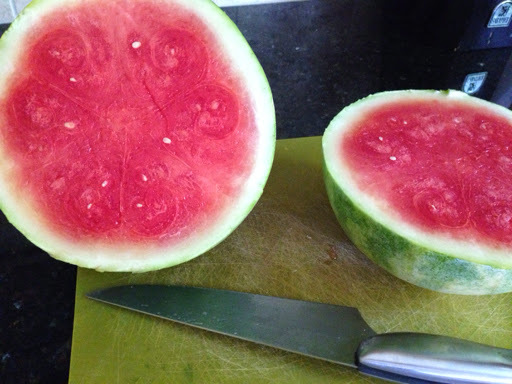 I've hear people describe this fruit as "just water and sugar" but did you know that watermelon is a great source of flavonoids, carotenoids and triterpennoids that make this fruit super! These compounds are anti-inflammatory and are antioxidants. Watermelon also contains a high amount of lycopene which is great for heart and bone health. Plus, you can eat a whole up of this refreshing fruit for only 46 calories, 0.2 grams of fat, 11 carbs, 0.6 grams of fiber and 1 gram of protein. Now if you're like me, watermelon cutting (and eating) is messy business. 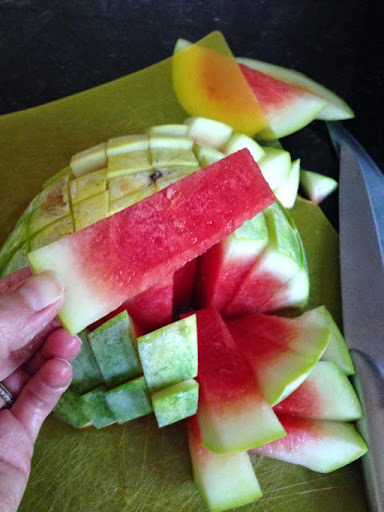 Today, I NEEDED to eat watermelon, so I tried this new little kitchen hack that is kid friendly (and messy adult friendly). 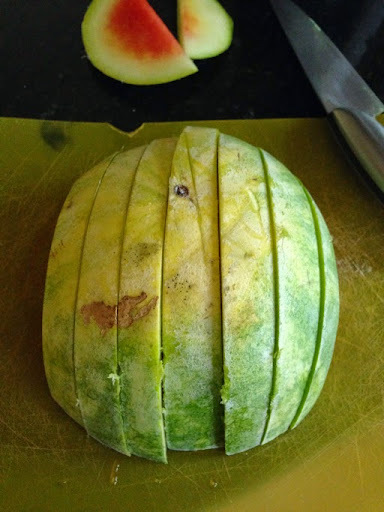 STEP #2: Flip one half of the melon over and cut into 1 inch strips. STEP #3: Do the same cuts only the opposite way. Viola!